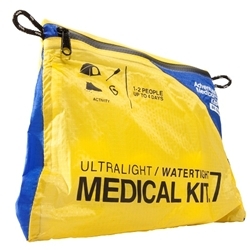 Adventure Medical Kits Co-Founder Frank Meyer shows you the Ultralight / Watertight .7, the preferred kit of professional adventure racers around the world. With its double-layer waterproof protection, this is the kit to use whenever exposure to the elements is an issue. The Ultralight / Watertight Series features proprietary DryFlex™ bags for the ultimate in ultralight, waterproof storage. For the multi-sport athlete that refuses to be let down or weighed down by his or her gear.The Ultralight / Watertight .7 is designed for adventure racers, multi-sport enthusiasts, and anyone looking for an ultralight kit with enough supplies for 1-4 people on trips up to four days. Inner DryFlex™ waterproof liners and seam-sealed outer silnylon bags provide multiple layers of protection from the elements. This is the kit for adventures where exposure to the elements will be an issue.